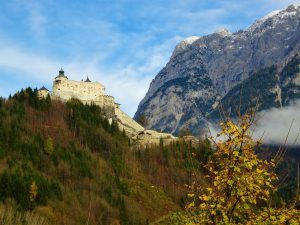 Home Austria	Salzburg, Austria – And a day trip to Werfen! Salzburg, Austria – And a day trip to Werfen! 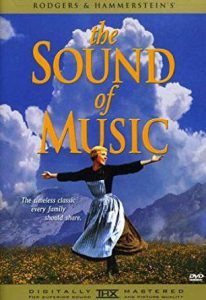 I was 27 years old when I finally watched The Sound Of Music for the very first time. And it wasn’t because I hopped online to order it, or happened across it on TV. It actually wasn’t a decision I had made at all, it was as if the universe had decided it was time. The movie, as you may already know was filmed in Salzburg, Austria. And that just so happened to be where I found myself at 27 – in Salzburg, in a hostel that had a showing of The Sound Of Music. Every. Single. Night. My very first night in Salzburg I watched The Sound Of Music with a few newly made traveling friends who hadn’t seen it either, which turned out to be an awesome added bonus. The whole next day we scoured the city and checked out many of the well known filming locations, such as the Mirabelle Palace and Gardens, Pegasus Fountain and Musical Steps, the Horsebath, St Peters Church, Residenz Square, Nonnberg Convent Abby, and many more. We did this on our own, however you can book a Sound Of Music Movie Tour if ya like! Salzburg is easily seen in the span of a weekend, there is literally something to see around every corner. 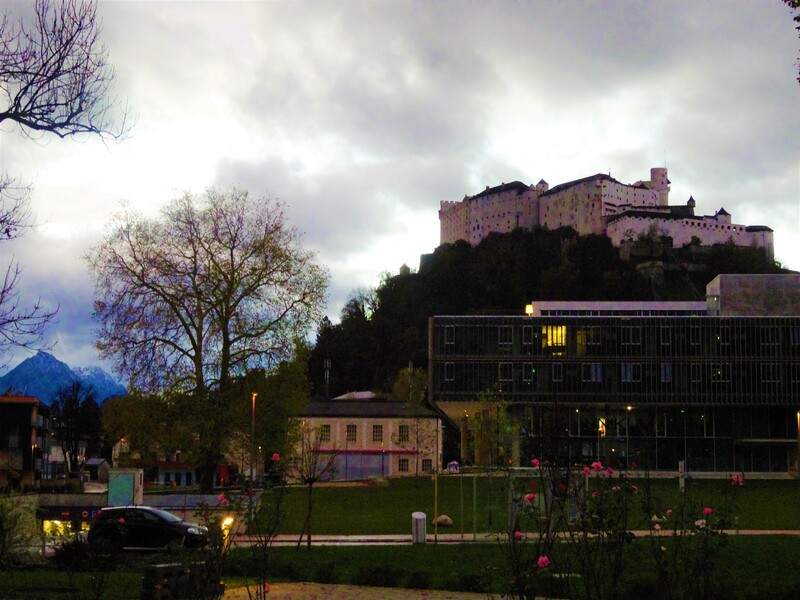 No matter which direction you enter the city of Salzburg, you will undoubtedly be met with a fantastic view of the Hohensalzburg Fortress. Perched up on Monchsberg, one of five mountains in Salzburg, the Hohensalzburg Fortress casts quite the medieval backdrop and is the largest in-tact castle of central Europe. If you’re feeling especially fit, you can walk the castle road to the top. It’s a beautiful trek that takes about thirty minutes. Otherwise, the funicular from downtown is a second option and it runs every ten minutes. Inside the Hohensalzburg Fortress you will find the Fortress Museum, complete with audioguides. Admission for one adult is just under 13.50 USD. Domplatz is a main square in the center of Salzburg’s old town. In late November and December every year there is a beautiful Christmas Market held here. 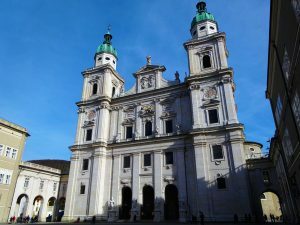 Not only is this a top attraction for tourists, it’s also home to one of the largest catholic churches in Central Europe, the Salzburg Cathedral. This cathedral was one featured in The Sound of Music and is the same cathedral where Mozart was baptized. A quick four minute walk North from Domplatz, towards the Salzach River, is the birthplace of Mozart. House No. 9 in the Getreidegasse is easy to spot, a brightly painted yellow building against your typical array of neutrals and off white’s. 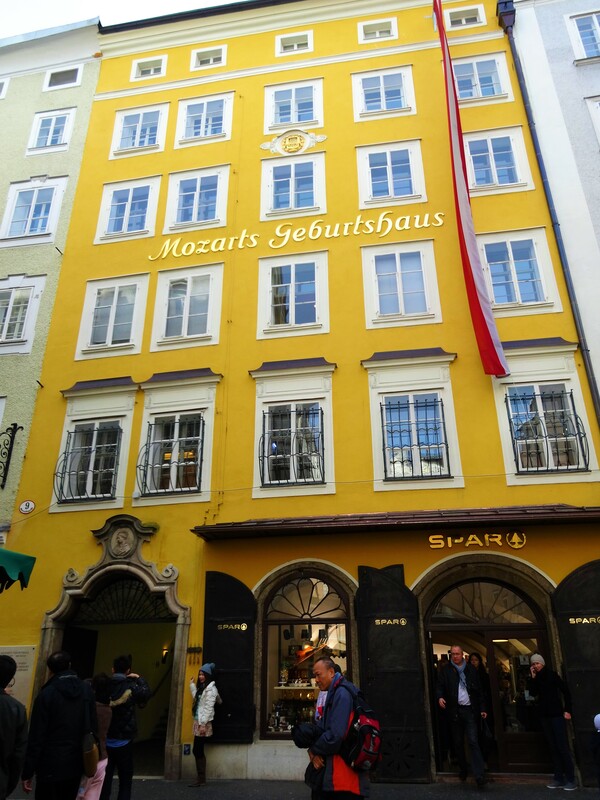 Born on the third floor back in 1747, Mozart spent his childhood and much of his youth in house No. 9, what now is a museum. It was here that his family lived for 26 years, before moving to what we call, “Mozart’s Residence” in Vienna (read about that here). This museum is not wheelchair accessible, costs just under 13 USD to enter and takes about an hour, to an hour and a half, to see in it’s entirety. A few minutes from Mozarts birthplace is Kapitelplatz, easily one of my favorite squares in Salzburgs’ old town, mainly due to it’s peculiarity. 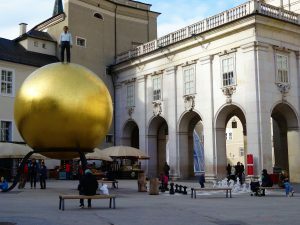 When entering Kapitelplatz the first thing you see is a huge gold ball with a man standing on the top. 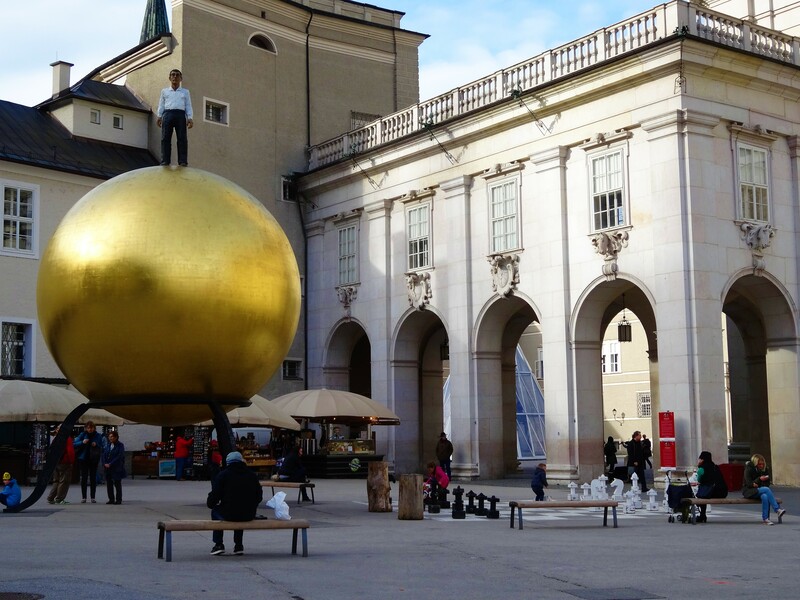 There are many speculations as to the meaning of the man on the gold ball, although there is no true explanation of this strange piece of artwork. Next to the gold sphere there is a rather large life-sized chess set, and further into the square a fountain of Neptune on a seahorse can be seen. As if this square couldn’t get any more intriguing, opposite these works of art is a fantastic (probably the best) view of Hohensalzburg castle sitting magnificently up on the hill. After you mosey around Salzburg and soak in all of the sights, plan a day trip to Werfen! The town of Werfen is a 45 minute train ride from Salzburg. If you are already in Salzburg, I’d encourage you to go! Werfen has two main attractions that it’s known for; The Hohenwerfen Castle, and the Eisriesenwelt ice cave, which is the largest in the world and the only reason I took the trip out to Werfen if I’m being honest. My trip to Werfen was a total flop. So at some point in my life I’ll have to make the trip a second time. I got there just two days after they closed the ice cave for the season! Imagine my disappointment. On top of that, the Werfen castle was closed due to a broken cable car and other “construction” that was ONLY taking place on that day. Unfortunately I was headed out of Austria the following morning. So I’ll have to experience Werfen another time. Sometimes things just work out that way. Admission into the castle is about 17 USD and it cost about 28 USD for the ice cave which is only open May 1 – Oct 26. Not October 28th! Check out my post on Vienna, Austria here! Have you been here? Are you headed here? Did you have better luck at Werfen? Tell me about it in the comments below! I reply to them all! Great article! I always love reading travel articles because I get to live an experience through the writer. How awesome it must be to travel in the area where Mozart lived. When I read that many things were closed Werfen and you were unable to really see them I can only imagine how disappointed you were. Do you have a favorite part of the city, or some feature that stood out most to you? Thanks again for the read! Hello Matt! Yeah I was super bummed about my Werfen trip, but there’s always next time! As far as my favorite part of the city … I really enjoyed so much of it, but Kapitelplatz was undoubtedly a highlight! Thanks so much for stopping by! I absolutely love Mozart. He has such a huge influence on music and it would be so amazing to see where he grew up and what inspired him. That is the same with the sound of Music. What an incredibly rich in history place to visit. I will definitely be putting this on the list. Love your website and all the information you have on here. Excellent post.